The staff of Care Center (Cincinnati, Ohio) is thrilled to share the impending launch of one of the most exciting technological advances ever seen in veterinary cancer treatment. In fact, Care Center will be the first to make this new technology available in the Cincinnati area, which will significantly aid the veterinary community’s ability to serve their clients by helping pets live longer, healthier lives. 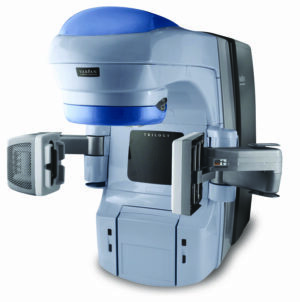 Through a partnership with PetCure Oncology, Care Center is nearing completion of a significant upgrade to their radiation therapy program by incorporating a Varian Trilogy®. This equipment, along with a team experienced in the administration of radiosurgery, will provide access to a treatment that delivers a precise dose of radiation with sub-millimeter accuracy anywhere in the pet’s body – with curative intent. The technology has emerged as the standard of care for humans over the past decade and is now in the hands of the highly skilled veterinary specialists at Care Center. Radiosurgery solves the major hurdles for cancer therapy delivery for companion animals. Standard radiation currently requires 15 to 30 visits with anesthesia administered during each visit. Further, most of these treatments are palliative in nature and do not allow for sparing of healthy tissue because they deliver a broad beam of radiation that impacts a much wider area than just the tumor and can cause serious side-effects. On the contrary, radiosurgery via Varian Trilogy® can deliver the same dosage in only 1 to 3 visits and is designed to spare healthy tissue while focusing on a curative intent. Both Care Center and PetCure Oncology have extensive experience in delivering advanced therapies for cancer. Care Center has been operating a robust radiation oncology program at its Cincinnati location for ten years in conjunction with medical and surgical oncology specialists. This cutting-edge equipment requires additional clinical and operational expertise, which we will be provided through the partnership with PetCure Oncology. Over the last decade, PetCure Oncology’s parent company Accelitech, built the largest private network of human radiosurgery centers across the US and Europe in conjunction with leading hospitals. The PetCure Oncology leadership team is a combination of some of the most respected human and veterinary cancer care professionals in the country and together, is focused on helping standardize clinical protocols and improve the outcomes of more animal cancer patients. The radiosurgery site at Care Center is currently under construction, they anticipate being able to accept patients for radiosurgery in July of 2015. In the meantime, the Care Center doors are always open for collaborative patient care. You can learn more about radiosurgery at www.petcure_wp191cology.com.